Nothing says spring like fresh local asparagus. The season is about done here and the grocery store stock later on will not be as tender, probably because it’s picked too early wherever it comes from. Our local asparagus, even when the stalks look too thick, is always tender and the taste is incomparable. I wanted something grand to pair with the asparagus and the large Louisiana shrimp at Wegman’s was just the right item. Everything but the orzo was grilled, then it was all combined at the last minute. Cooking the orzo in chicken stock created it’s own sauce, so it was really easy. I added one diced canned San Marzano tomato, some fresh garlic, and parsley to the stock as it was simmering to round out the flavors. Mix all marinade ingredients and add to the shrimp in a large resealable bag. Toss to coat and refrigerate for a couple of hours. Just before grilling the shrimp, thread onto skewers. I don’t add salt until the shrimp are on the skewers ready to grill. 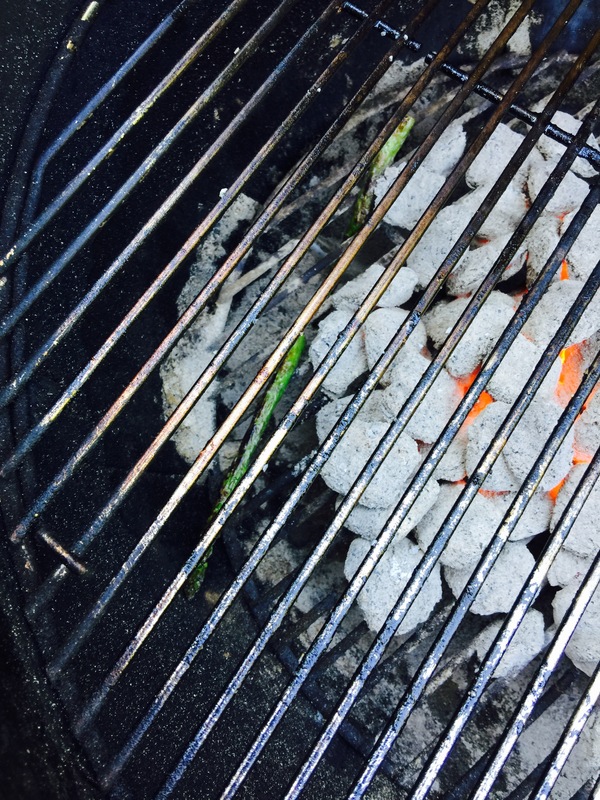 Set up your grill for about 350°-400°; I used 60 charcoal briquettes, turning them out of the chimney into the center of the grill. 1 lb or more asparagus stalks, trimming if necessary. I only added the 3″ tips to my dish, saving the grilled ends for other uses during the week. Grill all the vegetables in stages, or as they fit on your grill. Set each aside until all are finished. I peeled my peppers when they were done. Prepare the orzo before you grill the shrimp. Grill the shrimp at the last minute and place over the top of the pasta. Grill over direct heat just until done, only a few minutes on each side until all the shrimp are pink. Bring all the ingredients to a low boil, stirring often so the orzo doesn’t stick to the pan, then simmer for about ten minutes or until the orzo is tender. Stir in the chopped grilled vegetables, then top with the grilled shrimp.